The biggest risk is responding too slowly to social media feedback. “If they get no response, it can turn ugly really quickly,” says Scott Stratten, president of UnMarketing in Oakville, Ont. Monitoring, adds Stratten, if a “full-time thing”. Devote a conference volunteer or third party to the job, says Meagan Rockett, director of client services at Greenfield Services Inc. in Alexandria, Ont. She recommends monitoring software like Hootsuite, plus having concise policies and procedures. A unique event hashtag organizes the flow of posts about your event. But since hashtags can’t eb copyrighted, double-check to avoid confusion. We scour the Twitterverse to make sure that the hashtag that we’d like to leverage is one that’s open and available,” says Anne Bowie, director of live brand experiences at Bond Brand Loyalty. She also advises making hashtags memorable and concise and promoting them broadly. 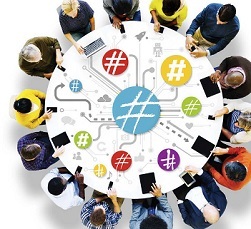 Don’t neglect this step, says Stratten—otherwise people will likely make up their own hashtags for your event. “A common pitfall is to overshare,” says Austen, “to just promote and plaster messages and not replying, not retweeting, not engaging in conversations.” o eep ollowers appy, usten ecommends uthentic argon-free onversation. ollow he 0/20 ule here 0 er ent f he ime ou’re haring elevant ndustry ontent, nd 0 er ent ou’re oing irect romotion. Not seeing any event buzz online? It’s not a reflection on the event’s success,” says Stratten. Some audiences are tech-savvy, he says, while others aren’t.